PATENT examiners and other EPO staff went outside to march. They exited in protest and walked in the streets of The Hague. They targeted French and German officials in particular. Later this morning we explained why everyone in Europe should support them. They’re not spoiled or even combative, they’re abused and constantly under attack. They’re barely even allowed to fall ill and they’re under tremendous pressure to work fast (sloppiness and decline in quality inevitable), so even those who are obedient, docile, passive, defeatist etc. are not safe in this kind of environment. The EPO essentially became a sweat shop with Chinese standards; I’ve heard all sorts of stories as such from my wife (she used to work in Taiwan) and the EPO is actually a lot worse than any of these. It became worse to work for the EPO in Munich or The Hague than to work for an electronics firm in Taipei. What does that say about Battistelli, who is forging closer ties with the Chinese these days? “The EPO essentially became a sweat shop with Chinese standards…”Based on EPSU, which supplied the photograph above and previously expressed support of SUEPO: “Demo staff European Patent Office after dismissal TU reps. EPO Director claims immunity. Lawlessness needs to end” (not just lawlessness but worse). David Brooke, a writer at WIPR, said “1000+ reportedly at The Hague EPO demo” (he linked this to a deleted tweet from John Kerstens; it’s also deleted based on this). John Kerstens has a history of supporting EPO staff (e.g. [1, 2, 3]) and there is no sign of any similar tweet in his page right now. It says nothing about the EPO today, so we’re assuming he had a change of mind/heart and so his writings just vanished. This was noticed by a few EPO-centric accounts online (mostly Twitter); there may have been other deletions, either related or unrelated to this. It’s a bit strange. We spent hours researching prior to this post and we still don’t know the cause for such a deletion. There are deletions definitely taking place, so anyone who has more details is encouraged to contact us or say something in the comments below. Did Kerstens give a speech today? “Mr. Cordery must have traveled a long way, so well done to him.”According to this, “Sharon Gesthuizen & John Kerstens Dutch MP + Philip Cordery French MP, FNV, Media present and +1000 participants! Mr. Cordery must have traveled a long way, so well done to him. He’s actually doing his job these days. Remember that a Frenchman is involved or implicated in the latest crackdown on SUEPO, too. Several people independently claim over 1,000 and given the number of staff at The Hague, that’s a huge number. It’s a very high percentage, maybe even the biggest ever. Here again is that "union recognition" (or "social dialogue") lie. Have these people got no shame? That’s like ISIS claiming to be pursuing a peace deals while beheading people. It makes no sense at all. Totally incredulous observers should gasp and preferably respond to such utter lies, which seemingly get repeated by an unchallenged PR team. Is this the idea of FTI Consulting? Merchants of fracking that poisons people's drinking water? The EPO is now an empire of lies and deception. It’s not more credible than a Blatter-led FIFA. “It’s good to see that Dutch media, for a change, did cover the protest this time around (it hardly did the last time).”“Dutch television reports about the “Protest against the intimidations at the European Patent Office”,” said this comment earlier in the afternoon. Well, the link there is broken and searching the site (even its Twitter feed) netted nothing relevant. It was about a Dutch broadcaster called Nos. It turned out to have published a lot on this matter. Here is “Protest tegen ‘intimidatie’ bij Europees Octrooibureau”. Translation from Dutch is needed. Marijn Duintjer Tebbens also published “Hoe ver gaat de immuniteit van het Europees Octrooibureau?” It is apparently about “Immunity”. Translation from Dutch is again needed. One more article from Nos is titled “Onderzoek naar sociale situatie Octrooibureau”. Translation from Dutch would help us understand what seems like a unique angle here. “Dutch Government Disposes Independent Social Study on current working and social conditions” is a rough translation of the gist, according to an aforementioned account in Twitter. A Dutch news site in the English language said that the “European patent office staff [would] demonstrate against ‘intimidation’”. To quote parts of the article: “Staff from the European patent office in Rijswijk are planning to demonstrate against the sacking of two collegues and the demotion of a third, broadcaster Nos says on Thursday. “All three are union activists and based at the patent office’s headquarters in Munich. Lawyer Liesbeth Zegveld, who represents the union, says the issue is one of ‘pure intimidation’. 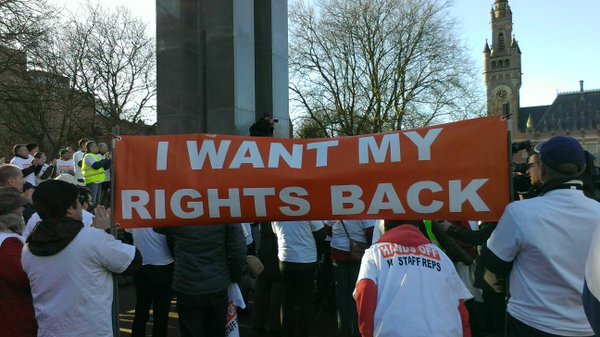 Workers complain they have no rights. ‘We’ve got a sort of secret service which controls the staff,’ one worker told Nos. “More people all across Europe are rapidly becoming aware of these issues (irrespective of corporate media) and are contacting national representatives.”Having been gathering some new bits of information and a list as complete as we can of articles, including the latest lies from the EPO’s management and PR team, let us add “Medewerkers Europese Octrooi Organisatie in protest tegen ‘angstcultuur’” and “Personeel protesteert tegen ‘intimidatie’ bij Europees Octrooibureau”. For these two we are going to need translations. Can someone please consider mailing translations to us (contact details and PGP key, if needed, are on the right pane).